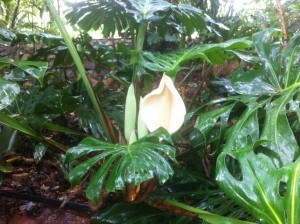 Growing right now all over Augusta de Mist is this rather exotic flower. This member of the Arum family is an epiphyte with aerial roots, able to grow up to 20 m high with large, leathery, glossy, heart-shaped leaves 25–90 cm long by 25–75 cm broad. Young plants have leaves that are smaller and entire with no lobes or holes, but soon produce lobed and holed leaves. Fruits of plants of the Araceae (Arum family) often contain Raphides and Trichosclereids – needle like structures of calcium oxalate. The fruit may be ripened by cutting it when the first scales begin to lift up and it begins to exude a pungent odor. It is wrapped in a paper bag and set aside until the scales begin popping off. The scales are then brushed off or fall away to reveal the edible flesh underneath. The flesh, which is similar to pineapple in texture, can be cut away from the core and eaten. It has a fruity taste similar to jackfruit andpineapple. The unripe green fruits can irritate the throat and the latex of the leaves and vines can create rashes in the skin, because both contain potassium oxalate: that’s the reason why the fruits have to be consumed when the scales lift up.